Ninety years after the last distillery in Ross-shire in the Highlands of Scotland closed its doors, a highly unique community project, led by 'Flying Farmer' John F McKenzie and Community Shares Scotland, aims to reinstate the art of craft whisky distilling in Dingwall, Ross-shire. On April16, 2016, 270 years to the day after the Battle of Culloden, the GlenWyvis distillery community share offer was launched. Founder John F McKenzie says: “We have seen a remarkable surge of interest in the first community-owned Scottish distillery which has triggered over half a million pounds of investment in the first few weeks – and we encourage interested parties to help us hit our overall target of £1.5 million. 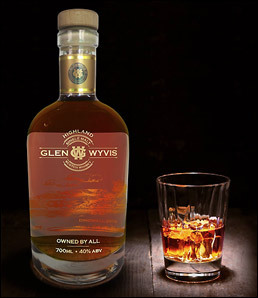 “The GlenWyvis distillery has been named for its historical connection to two earlier distilleries: Ben Wyvis, the previous distillery on the proposed site of a proposed visitor centre; and Glenskiach which operated in Evanton, six miles to the east. Ross-shire was once home to several whisky distilleries and so our community share offer is an opportunity to invest in the rebirth of a once proud local industry. “Many elements have converged to make this an outstanding distillery proposition,” says John, "it is not just the history and location – it is all about the community and natural resources too. We have taken great time and effort to consider every aspect of creating the distillery here - bringing together a strong board of whisky experts with a track record in start-up distilleries; the siting of the distillery on the farm harnessing renewable energy; locating water sources and setting out our longer term financial engagement with the community and investors. “Strong local engagement is important; hence we have made a special investment level of £250 for the local community with investment tranches rising from between £750 to £50,000* with a range of defined rewards for each level including a short helicopter trip for investments over £2,500. We are seeing great interest from the rest of the UK and overseas and we welcome anyone who wishes to invest and be a part owner in the distillery." 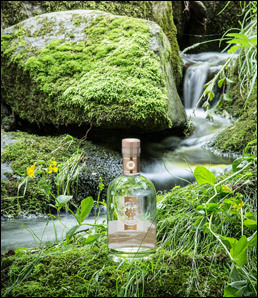 John adds: “Whisky enthusiasts and aficionados like to know where the water sources come from and we are very privileged to have our own water sources on the farm. Water from Ben Wyvis flows into the Skiach, and the Skiach then flows into our hydro dam via Glen Wyvis and the Docharty Burn. “These waters and those of nearby Tulloch Spring will be used for cooling purposes at the distillery, while the water from a new underground borehole on the GlenWyvis site will be used to make the whisky - making us self-sufficient. “In addition, a modern heating system will be powered by the energy produced by the existing farm renewable technologies with heat coming from Biomass and Solar thermal."